A stream runs through a small, rolling valley, north of Baltimore, Maryland. The soil is rich along this tributary of Big Gunpowder Falls, which flows to the Chesapeake Bay. Into this “Long Green Valley” came some Amish Mennonites from Pennsylvania in the eighteenth century. They built stone houses, raised large families, and farmed the land for many years, alongside their Catholic and Protestant neighbors. When the Civil War broke out many returned home to Pennsylvania. A small group remained, many of whom are buried in the walled cemetery on Kanes Road. Our story starts in the fall of 1897. John Matthias (J.M.) Prigel, and his wife, Wilhelmina, affectionately known as brother Mott and Aunt Minnie, joined the Church of the Brethren in Baltimore. They were baptized into the Woodbury congregation, he in 1893 and she in 1899. The Prigels moved to the Long Green Valley where they lived on the Rankin farm. The Prigels and Charles P. Bonsack were visiting a Sister Haines, who had been living in the Valley some years and was isolated from her church. At the earnest plea of Sister Haines and J. M. Prigel, Charles P. Bonsack agreed to hold a revival in the community if a place of worship could be found. The Mennonites shared their facility. By 1902 church services for the Brethren were held in the Mennonite meetinghouse on Kanes Road every fourth Sunday of the month. 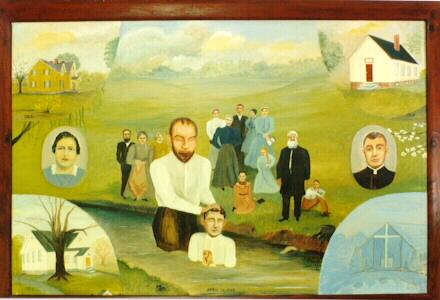 In April of 1903 five persons, some of whom came from that Mennonite church, were baptized by Charles P. Bonsack in the stream on Prigel’s farm. They were Ida and Lillie Nafzinger, Emma Neuhauser, John Breidenbaugh, and Maggie Glee. The organized effort by the Brethren in Long Green Valley began May 1, 1903. Services continued in the Mennonite church for the next four years. After a revival was held by Abram P. Snader some objections were raised about his doctrinal sermons, and it became necessary for the Brethren to move to another location. J.M. Prigel and his two nephews, John C. Breidenbaugh and Christian P. Breidenbaugh began holding church services in the Prigel’s home. Brethren ministers from Carroll County, particularly from the Meadow Branch Church, came regularly to aid in the venture. The Prigel family housed these traveling preachers, and readied their home for Sunday services, preparing dinner for all. Some missionaries on furlough would also visit this new fellowship and encourage them. A Sunday School program was started in 1906. In April of 1908, the Brethren in the Long Green Valley petitioned the Eastern Maryland District, asking that funds be raised to help build a meetinghouse. Samuel Utz of New Market was authorized to solicit money for the new church. The funds were soon raised and a lot was purchased from Dr. S.M. Rankin, for $1,000.00. He was the former owner of the Prigel farm. Dr. Rankin also donated the logs from his woods to build the new church. The cutting and hauling of the trees were all done by volunteers. Samuel Neuhauser did the sawing free of charge at his sawmill on Long Green Rd. A small meetinghouse was built and dedicated on October 25, 1908. At this time there were thirty members in the fellowship. In 1910, they invited the Mission Board of Eastern Maryland District to come and hold a council meeting in the new church and take the voice of the membership whether a congregation should be organized. The Mission Board sent George Sappington, A.P. Snader, Tobias Fike, William E. Roop and John A. Smith to hold the council. 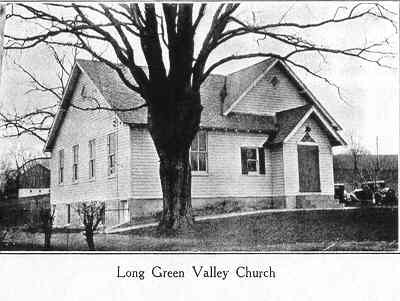 It was decided by a majority vote to organize a new congregation to be known as Long Green Valley, hence our name. The first trustees were Moses Nafzinger, J.M. Prigel, William Stauffer, John Prigel, and J. C. Briedenbaugh. When the congregation was organized, A.P. Snader was elected elder-in-charge with C.P. Briedenbaugh as clerk and Joseph Southard as treasurer. There was no resident minster until October 7, 1911, at which time J.M. Prigel was called to the ministry. He was ordained to eldership in 1916. In 1925, with the donations and hard work of the members, and some help from the Woodbury Church, an addition to the meetinghouse was constructed. Now there was more room for the growing Sunday School program. This was accomplished without any debt and was dedicated on October 25, 1925. At that time there were about 100 members. The first wedding in the meetinghouse was that of Dennis and Martha Reed in August of 1926. This was a new development for the Brethren. Prior to that time ceremonies were performed in the homes of those involved. This was an era of great change for our denomination in general. Gradually the Brethren were shedding some of their plain garb, but this did not come without struggle. Was it right for a brother to wear a tie, or a sister to wear jewelry? What about prayer coverings for the sisters? There were plenty of long council meetings asking such questions. In the early 1940’s, brother William Kinsey, then pastor of the Bush Creek congregation, painted the picture of Jesus praying in the garden of Gethsemane which graced the front of the sanctuary for many years. He shared this talent with many other congregations. The contributions of other ministers over the years made their impact. Many of these were students from Bethany Seminary who spent a summer in the Valley. Others were called out from within the congregation to preach and teach, as needed. In the early 1950’s, brother Frank Williar was called as pastor, paid part-time, of this congregation. At the same time he also served the North Baltimore Church of the Brethren, a new fellowship in the city. 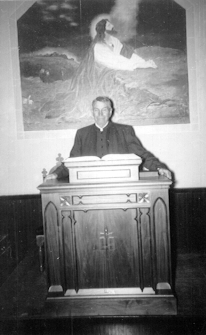 In 1957 a school teacher by the name of Paul L. Groff was called to be Pastor. Not long afterward, he was asked to put his energies full-time into this church in the Valley. With his leadership, Long Green Valley grew rapidly. Soon we could not fit into the old church, so a new building was erected across the road in 1962. Brother Mott served the church as a minister for the last forty nine of his eighty seven years, his God-given vision for a church in the Valley having called it into existence. On October 5, 1960, he went home to his heavenly Father. Able leadership has guided this church ever since: Paul Groff (1957-67), Dale Varner (67-70), Ralph Detrick (70-74), Kenneth Long (74-78), Bernard King (interim 78-79), Scott Duffey (79-89), Warren Kissinger (interim 89-90), and Pete Haynes (1990 to the present). A fellowship hall was built in 1988, which was fully paid for in mid-1999. This hall houses Sunday School rooms, a gym, and a very modern kitchen. At present we have 150 active members, not counting many young children. We have an active ministry here, focused both on inward growth and outward mission. There is picture in our entryway, painted by sister Martha Reed. In the center of the scene we see the beginning of our church and a baptism in the stream on the Prigel farm. In the upper left-hand corner is a picture of the Prigel home and on the right we see the first meeting house. As you look at this picture, you can see her dream of what a future church would look like. It is remarkably similar to our new building. The story of these Brethren in the Long Green Valley continues. “In 1925 they were digging the foundation for the Sunday School rooms with a scoop shovel and a pair of horses. Margaret Cuffens, Philip Eckhart, and I were running around where they were digging and I slipped into the foundation and got red mud all over me…. Twelve were being baptized at 12:00 noon on Sunday when I was 12. I was so sick with a high fever but I wanted to be baptized with the others so they carried me and by 3:00 o’clock that afternoon my temperature was down to normal…. Verlin and I were married at the church August 9, 1939…. Verlin and I were Youth Counselors and took the youth to the first National Youth Conference at Anderson, Indiana in 1954.